Wicked Saints is told in two, third person point of views, following Nadya, a cleric, and Serefin, a powerful blood mage and High Prince of Tranavia. Tranavia has been in a violent holy war with Nadya’s country, Kalyazin, and they’re winning. But Nadya may be able to change this. She is the last known cleric, and when she prays, the gods answer and grant her magic. She believes she can turn the tides of the war and save her people, and in order to do so, she joins forces with three strangers, one of which a powerful blood mage, Malachiasz, to kill the King of Tranavia and end the war for good. Meanwhile, Serefin has been on the war front for years, but when his father tells him to return home, paranoia takes root, and he begins to wonder if the palace is more dangerous than battle. This may be Emily A. Duncan’s debut novel, but you cannot tell. Her writing style is vivid, atmospheric, and beautiful. Her style and voice is similar to Leigh Bardugo but has a unique aspect that makes it clearly hers. She balances the darkness, bloodiness, and the grim reality of her world, with the occasional bit of humor and fun quips. Speaking of her world– oh my god this setting. Kalyazin and Tranavia are basically fantasy medieval Russia and Poland, and while that influence is clear, they both are extremely well developed and manage to feel completely separate from their real-life counterparts. I really loved this setting. You can tell that Emily A. Duncan did her homework because the world is so tangible and just amazing. There isso much history included in this book and I absolutely adored it. So, before jumping into this I heard mixed reviews about the beginning. Some people said it was slow, and some people said it was quick, and I’m sorry to say that I agree with them both. While the beginning jumps into action immediately, it definitely takes about 80 pages to get used to the characters and setting enough to become fully immersed. But seriously, it’s worth it. This book has so many twists and turns, and you never know who to believe and what to trust. My heart was broken so many times, then healed, then broken again. I just need to say it right up front- I love Malachiasz so much. This monstrous, anxious boy is amazing and by far my favorite part of this book. He has some great quips, and such a fascinating (and somewhat tragic) backstory and I. Am. So. Invested. Seriously, this character is my life now. I would die for him, and he would let me. But I can’t rant about him forever, because there are two other disastrous characters I now love. Nadya is fantastic. She has some great development and feels grounded, with natural doubts and insecurities while remaining a strong character. And then there’s Serefin. Awkward, charming, and probably alcoholic Serefin. Nadya at one point describes him as favoring self-deprecation and complaints and honestly? Same. After reading this book, I really can’t blame Serefin for drinking so much and I probably would too. We also have some great side characters (Parijahan, Rashid, Ostyia, and Kacper), and I really look forward to seeing more of them in the rest of the series. Cons- That ending hurt me and Emily’s tweets about book 2 are just scaring me now. 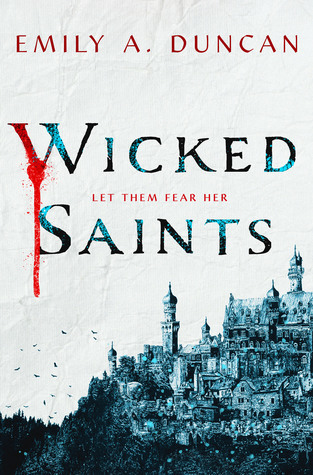 Wicked Saints is perfection. Its enthralling, magical, epic, and unforgettable. Just be prepared to be willing to die for the sequel. Everyone seems to be loving this one!!! Definitely have it on my TBR!